In this fascinating and thought-provoking presentation, internationally-noted futurist and sociologist Dr. Michael Zey reveals to your audience the techniques business, government, and education planners should use in their effort to realistically anticipate and prepare for the future. 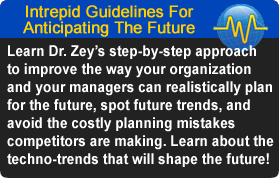 Dr. Zey delivers to your organization a step-by-step approach to improve the way it plans for the future and avoid the costly mistakes competitors are making. Your audience will take away from this presentation a plethora of techniques for honing their prediction skills and identify trends. Adopt a Big Picture Approach to the Future by Factoring in the Impact on Culture, Politics, And Economics. According to Michael Zey, companies and organizations that fail to detect the “next big thing” will quickly find themselves falling behind their competitors. 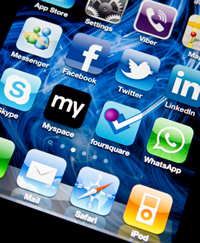 The growth of the Internet, cell phones, and social media, the Great Depression, the post-war economic boom and baby boom, the 2008 financial meltdown and the social impact of television and the automobile are just some of the developments largely unanticipated by futurists and business gurus. Even innovators themselves—Edison and Alexander Graham Bell, for instance—have misgauged the public’s willingness to embrace their inventions. Dr. Zey shows how he has applied these tools to future trend analysis. 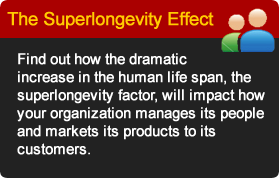 He discusses developments about which we can be reasonably sure, such as the Superlongevity Revolution, globalization of the economy, and the human enhancement revolution. 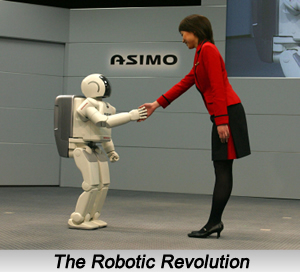 He discusses some probable developments, such as increased use of robots in the workplace, new forms of energy development. 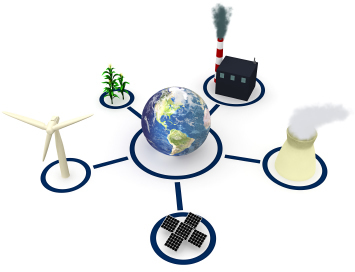 He invites the audience to brainstorm along with him about the “probable future” for these and other technologies. 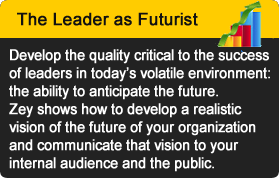 The audience will take away from this spellbinding presentation knowledge of how to use to the tools to enhance their ability to plan for the future and anticipate the events that will impact their organization’s future. This unique vision of the future has enabled Dr. Zey to write books such as Seizing the Future, Ageless Nation, The Future Factor, and his forthcoming Manifesto for the Emerging Future. As one of our leading authors, speakers, and thinkers about future.